Imagine coming home from work, (or walking up the stairs from your very own "store"), and having every kind of entertainment, shopping, or other need at your very fingertips. 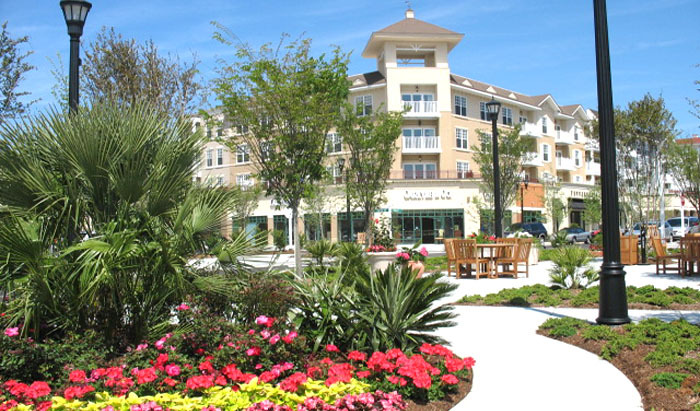 Living in the center of your own private "town" is what Market Commons is all about. Myrtle Beach has begun to center all the town activities here and at the city park it provides, and it's no wonder - the beauty of it is almost breathtaking. One long "Main Street" is home to some of the finest stores around: Victoria's Secret, Barnes & Noble, Bath & Body Works, and Southern Living. Dine in some of the finest restaurants in Myrtle Beach - P.F. Changs, Divine Prime, Ultimate California Pizza. Go to the movies at the newest and most luxurious theatres in the Grand Strand. Or just sit down in the center of it all surrounded by flowers and palms and enjoy the piped in music while you people-watch. You've got a grocery store and nearby health resources available too. If you've chosen one of the Live/Work condos, you may not ever need to leave! There are a lot of selections available in homes at the Market Common. Although most of the apartments directly above the stores are handled as rentals and not for sale, turn the corner and you'll find brand new condos, townhomes, and then single family homes with unbelievable options and amenities. 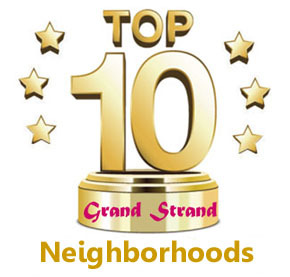 Parking is plentiful as are the things to do, see, and enjoy when you live in the best multi-use community in Myrtle Beach. This is living a dream! 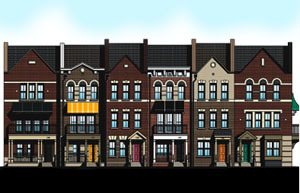 These brick townhomes provide a luxury two or three bedroom residence above a ground floor retail office or store space. If you're self-employed in some field that can utilize a small public shop, this is your chance of a lifetime. Prices from the low $300K's. Think of the multi-colored side-by-side homes in Charleston, or the brick ones in Wilmington, NC. Not a condo and more than a townhome, these brick row houses have a garage, a decoratively fenced in small front yard, are designed by famous architects Pegram and Associates. Condo amenities include crown molding, hardwood floors, granite countertops, and stainless appliances. They come in 2-3 bedrooms and run from the low to high $200k's. Coming in 2017, Dock Street's newest project is the South Market Row townhomes. The Marketview Townhomes are located in the center of Market Common, so are the most convenient to all the restaurants, shops, and things to do. 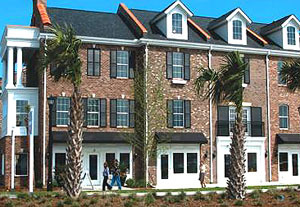 They are traditional brick brownstone townhomes with a front porch, 2 car garage, and optional elevators. Condo amenities include crown molding, hardwood floors, granite countertops, and stainless appliances. They come in 2-3 bedrooms and run in the low to mid $300k's. 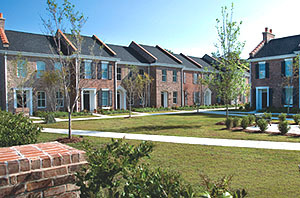 The Carriage Homes on Dock Street are two-story tumbled-brick townhouses with single or two-car garages, a private fenced courtyard, and the usual upgrades. 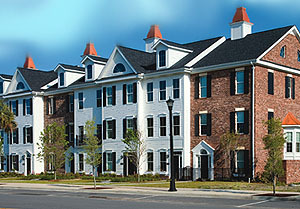 Three styles are available with the designations Alexandria Carriage Townhomes (2 BR), Bristol, and Clarendon Townhomes. The two and three bedroom styles range from $250-$325. Two bedroom Alexandrias are now sold out and would be pre-owned when available for sale. 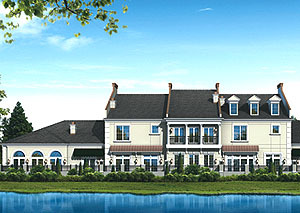 Those looking for luxury in a townhome will appreciate the Burberry Terrace townhomes. The Burberry homes are the closest thing to a single-family detached home you can find in a townhouse. There are four floorplans to choose from, from 1734 sq ft to 2680 sq ft, both single and double-level styles. The luxury of the homes comes from being direct Lakefront, along with being energy-efficient, sound-proofed block construction and finished in stucco. Each unit has a private, detached, two-car garage, and each style has its own special amenities, ranging from trey ceilings, fireplaces, elevators, balconies, and more. Of course, they include the granite countertops and stainless appliances as well as hardwood floors. Choose from two or three bedrooms that range from $400 to $600k. There are more amenities to this fantastic community than we can possibly mention here. We have brochures and floorplans available if you'll contact us and come for a tour!